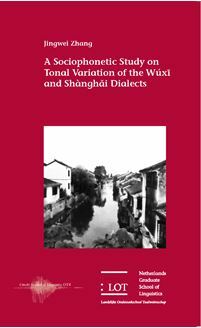 This dissertation describes the role of social, stylistic and linguistic factors in tonal variation and change in the Wú dialects, in the context of rapid urbani zation in China. The study is conducted in the framework of urban language studies, combining insights and techniques from sociolinguistics, phonetics and dialectology and is one of the first sociophonetic studies that focus on tonal variables. ban areas of Wúxi and Shànghai. Speakers were stratified for age and gender. Methodological issues such as the definition of the domain of tone and the choice of a tonal normalization procedure had to be researched as a prerequi site for an analysis of the patterns of variation and change. The analyses of the tonal variables show that some of the ongoing changes are internally triggered. The principle of ease of articulation results in the phonetic reduction of tonal shapes and tonal convergence results in phonemic reduc tion. Other ongoing changes, such as contour loss and tone borrowings from Putonghuà (the Mandarin standard variety) in both citation tone and tone sandhi, were found to be the externally triggered. Suburban dialects are more likely to show convergence towards urban dialects in the internally triggered variation, while they show divergence with the urban dialects in the externally triggered variation. This dissertation is of interest to scholars in the fields of sociophonetics, lan guage variation and change, tonal research, Chinese dialectology, and Chi nese historical linguistics.